Andrew Wells of Kaiserslautern grabs the leg of Ramstein’s William Brink. Six teams featuring five defending European champions were greeted by a raucous and energetic full house at the Brave New World Wrestling Tournament in Kaiserslautern’s new gym Jan. 12. Host Kaiserslautern was joined by Ramstein, Wiesbaden, Stuttgart, SHAPE, and Spangdahlem. Stuttgart won six weight classes, including three of the heaviest four divisions. Ramstein won three weight classes. 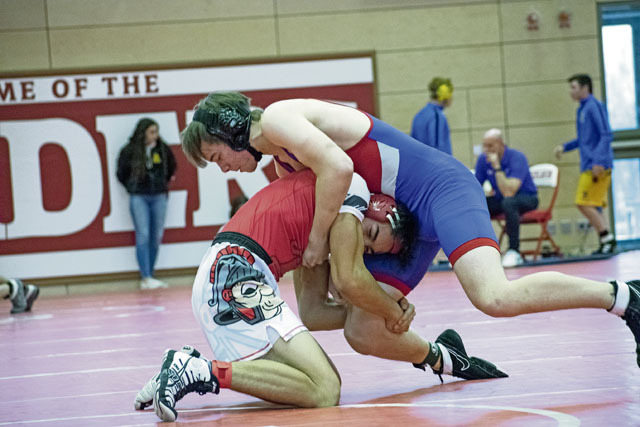 Kaiserslautern’s points came from sophomore Danny Aldana’s third place finish at 126, Christian Forker’s third place at 160 and freshman Javonte Reeves fourth place finish at 132 pounds. The historic first dual in the new gym was one of the most entertaining for its action, but also significant because of who competed. At 113 pounds, Ramstein’s Megan Short held the edge for the first seven and a half minutes of the match. But Faith Fairel of Wiesbaden turned her around and held on long enough for the three point pick up and the 9-8 victory. The significance? Last year more than 16,000 girls wrestled in high school throughout the United States and are readily competing against boys. 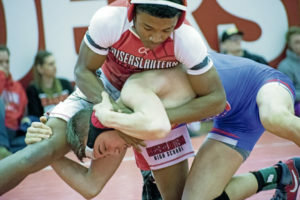 In a battle of defending European champions, Ramstein’s Connor Mackie defeated Atreyu Allen of Wiesbaden at 126 pounds. Royals Christian Griffith won at 132 and Theodore Ward was the winner at 220. 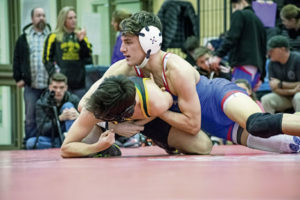 Perhaps the best wrestler in the field was Stuttgart senior Benjamin Fielding who is seeking another European crown at 138 pounds. Fielding immediately caught the attention of the crowd when in his first match he took the cue from the referee indicating game on, then approached, flattened and pinned his opponent in less than 15 seconds. He went on to win the title, defeating Ramstein’s Logan Campbell in the final match. Apparently the talent runs in the family. His sister, sophomore McKinley, won the 106 pound weight class, defeating defending European champion senior Andres Hart of Ramstein. Trip Carroll of Stuttgart defended his European heavyweight title. At 235 pounds and well over six feet, Carroll stands out. His goal after graduation is to attend the U.S. Naval Academy and wrestle there if he makes the team. He has only been wrestling for three years and says, admittedly, that he still has a lot to learn. But he showed his immense potential and cruised through the field, defeating the opponent he said gives him the most competition, Jackson Fontenot of Wiesbaden. With the victory, Carroll is the clear favorite to repeat as the top heavyweight in Europe. Connor Mackie, 126-pound champion, calculating his next move against Aiden Zary of SHAPE. Putting on a six-team, all-day-long wrestling event takes time, effort and excellent organization. Kaiserslautern Head Coach Brian Daly oversaw the management of the meet. Wrestling may also be the most intensely physical athletic endeavor. Imagine flexing every muscle in your body for nine minutes with a person that feels like a block of granite laying on you, tugging at your arms or holding them to the mat, turning you into a pretzel, tying up your legs, and countering every move you make to get you on your back, hold both shoulders to the mat to get a pin. In basketball or baseball or football, they get moments of rest and are able to catch their breath. On the mat, a moment of rest could mean getting thrown on the back and pinned. The wrestler knows that one moment of indecision, of relaxing, and he or she and the mat are intimately introduced. When trouble arises, the brain goes into overdrive to try to escape the peril. It is exhausting, both mentally and physically. But it is a lesson they will learn for life. Raider Javonte Reeves has the advantage on Ramstein’s Christian Griffith at 132 pounds. Wrestling may also be the fairest high school participation activity. In other sports, there are factors that an athlete cannot control that stacks the deck against them. Weight, height, speed, strength, gender. In other words, genetics. In most other sports, the determiner is age and grade and, as adolescents, there are huge discrepancies between, for example, two 16 year olds. In wrestling students compete against other athletes near their own weight, regardless of age or gender. It doesn’t completely negate the genetic factor, but it definitely evens the odds of a fair match. It also means that a championship at 106 pounds is just as impressive as a championship at the heavyweight level because the winner is the best on that day at his or her weight class. This weekend Kaiserslautern travels to SHAPE while Ramstein is in Stuttgart.